He says he invented e-mail. Dispute him at your own risk. Shiva Ayyadurai, 53, holds four degrees from MIT. In 1982, he received federal copyright protection for the code he wrote for a program he called EMAIL. His skeptics say that e-mail as we know it had already been used by scientists. Whatever you do, don’t tell Shiva Ayyadurai that he’s not the true inventor of electronic mail. Not unless you’re looking for a lawsuit. 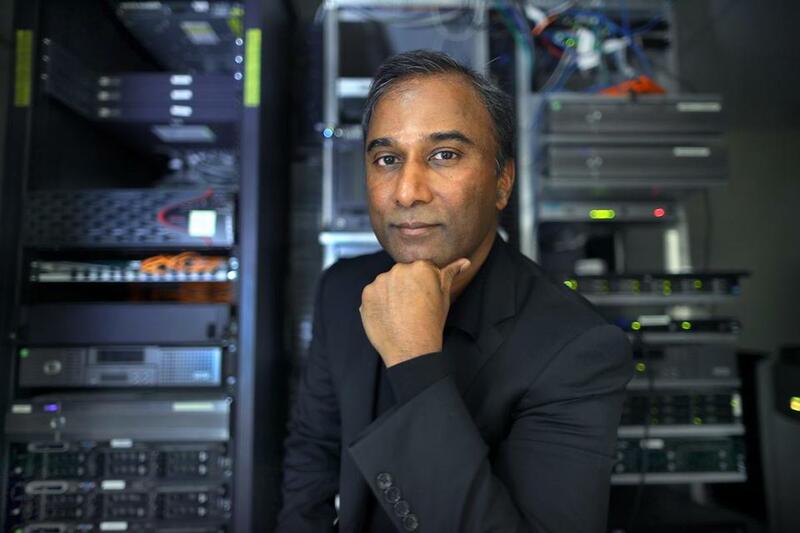 Ayyadurai, a boyish-looking 53-year-old, holds four degrees from MIT, including a doctorate in biological engineering, and runs several startup companies out of a Cambridge office building. But the Belmont resident is lately better known for going to court to defend his proudest achievement: creating in 1978, at age 14, an electronic communication program that he called EMAIL. Four years later, in 1982 Ayyadurai, then an MIT undergraduate, received federal copyright protection for the software code he wrote. As far has he’s concerned, that settles the matter: Shiva Ayyadurai invented e-mail. Actually, there’s a great deal of dispute. A number of technology historians and computer engineers from that era say early versions of e-mail date back to 1965, when Ayyadurai was 2 years old. The skeptics say that by the 1970s, e-mail as we know it today was routinely used by scientists on the ARPANET, a computer network that is considered the forerunner of today’s Internet. “You can’t invent something that’s already in widespread use,” said Thomas Haigh, a historian of information technology at the University of Wisconsin-Milwaukee and one of Ayyadurai’s leading critics. Ayyadurai has heard this before, and says those earlier versions were more akin to text messaging and not true e-mail programs as we know them today. He attributes some of the skepticism to racism. What makes Ayyadurai fighting mad, however, is being called a liar. It’s happened a lot, especially since 2012. That’s when The Washington Post ran an article saying that the Smithsonian Institution had recognized Ayyadurai as the inventor of e-mail. A number of Internet pioneers reacted with fury. The Post posted a lengthy correction. And ever since, Ayyadurai’s claim to e-mail fame has been routinely treated by his critics with dismissive contempt. But Ayyadurai has begun fighting back, suing Internet news sites that disparage his claim. He won a $750,000 settlement from the now-defunct Gawker after it lost a $140 million libel judgment to pro wrestler Hulk Hogan. “You can’t call someone a fraud, a liar, and a fake and hide under the First Amendment,” Ayyadurai said. Techdirt did not respond to requests for comment, but has said it intends to fight Ayyadurai in court. Ayyadurai’s pugnacious nature may be due to his early upbringing in India. Born in Mumbai to parents of a lower social caste, he remembers not being allowed to enter the home of a boyhood friend, and the friend’s mother giving him water in a different cup from other members of the household. “It still bugs me, almost 48 years later,” he said. Despite their low status, Ayyadurai’s father was an engineer, while his mother became a statistician. The family came to the United States in 1970, where Ayyadurai excelled in school, mastering calculus by age 14 and enrolling in a computer program for promising high school students at New York University. His mother got him a job in the computer services department of her employer, the University of Medicine and Dentistry of New Jersey, now a part of Rutgers University. The department director, Leslie Michelson, wanted an electronic version of their paper-based interoffice mail, but didn’t have time to work on the project. About a year later, Ayyadurai had written 50,000 lines of code and called the result EMAIL. Soon the university was using it to exchange messages across its campuses. Michelson insists it was the first e-mail program of its kind, and is outraged by those who call Ayyadurai a liar. But among technology historians, e-mail is one of those “inventions” that seems to have more than one inventor, or no one inventor at all; rather they contend modern e-mail developed from a series of innovations that began when Ayyadurai was an infant. One early innovator declined to be interviewed, fearing litigation from Ayyadurai. For example, a system called MAIL was developed at MIT in 1965, to allow multiple users of large mainframe computers to send messages to each other. In 1971 Ray Tomlinson, an engineer at Bolt, Beranek & Newman in Cambridge, developed software to enable two separate computers to exchange messages over an electronic network. Tomlinson famously came up with the idea of using the “@” symbol in e-mail addresses. To many in the field, Tomlinson’s work is generally considered the ancestor of subsequent e-mail systems. In 1975, John Vittal of the University of Southern California developed MSG, the first relatively easy-to use electronic messaging program, with now-familiar features like the ability to forward messages to others. “It seems to me that his case has been pretty thoroughly dismissed,” said Haigh, the Internet historian. His critics note Ayyadurai got a copyright, not a patent. Back then, federal courts generally held that software could not be patented. Ayyadurai filed for a copyright as the next best thing. But that covers only the code he wrote. It doesn’t prove he was first to conceive the technical concepts that make e-mail systems work. Nonetheless, he insists that his copyrighted e-mail software was the first to bring together all the key features of modern e-mail in a single program. The forerunners, Ayyadurai said, were little more than instant messaging apps by comparison. He has degrees from MIT in computer science and electrical engineering, mechanical engineering, visual studies, and biological engineering. In 1994, Ayyadurai launched a company that eventually became EchoMail, helping large businesses manage incoming messages, boasting American Express and Nike as clients in its heyday. These days, a much-downsized EchoMail runs out of Ayyadurai’s Cambridge office building, mainly serving small- to medium-sized customers. His other startups include CytoSolve , whose software is designed to simulate a drug’s interaction with human organs, like the heart or liver. “Shiva wrote a very unique algorithm that’s able to do that,” said Rudolph Tanzi, a professor of neurology at Harvard Medical School, who hopes to use it to find new treatments for Alzheimer’s disease. The MD Anderson Cancer Center at the University of Texas is also testing CytoSolve in an effort to find a cure for pancreatic cancer. Another Ayyadurai venture, Systems Health, provides training in “systems biology,” a health care technique that combines Western medical practices with traditional Asian techniques. But being the “inventor of e-mail” remains a central part of his identity. It’s on the cover of two books he has written about e-mail, and even adorns a sign in the lobby of his Cambridge building for his office, coupled with a picture of him from high school days.